Using Small Newtonians in a Terrestrial Setting. Snug as a bug in a rug, ken. As I discussed at length in previous blogs, my chosen grab ‘n’ go telescope of choice is a high performance Newtonian reflector with an aperture of 130mm (5.1 inches) and focal length of 650mm (f/5). The telescope has an excellent Skywatcher primary mirror, the original secondary mirror was replaced by a higher quality unit with a slightly smaller semi-major diameter of 35mm, yielding a very modest central obstruction of just 26.9 per cent. Both mirrors received new, state-of-the-art ultra-high reflectivity coatings to increase both light throughput and image contrast. The interior of the tube is lined with cork and covered with matt-black flocking material to minimise stray light and more effectively deal with thermals. Best of all, the entire outlay was very economical, setting me back just a couple of hundred pounds. In field tests, the instrument, once collimated and acclimated completely outclassed more traditional grab ‘n’ go telescopes, including a high-quality 90mm apochromatic refractor on lunar and planetary targets, double stars and a veritable pantheon of deep sky objects. In a series of more recent tests, it was shown to give better daylight images than a 5″ f/12 classical refractor and closely approached its light gathering power and resolution on a variety of nighttime targets. The instrument is very light weight and completely stable on a sturdy Vixen Porta II alt-azimuth mount equipped with slow motion controls. The instrument is very easy to collimate using either a Chesire eyepiece or laser collimator and perfect results can be achieved in a matter of seconds. Its low mass ensures that it acclimates very quickly to ambient, allowing me to engage with celestial targets very quickly. For low and medium power views (up to 80x or thereabouts), the telescope can be used more or less immediately. For higher resolution targets, it’s fully equalised in about 30 minutes, even on the coldest nights. Tucked away in its lightweight aluminium carry case, it has travelled to many destinations in the British Isles where its excellent optics has enabled it to perform flawlessly. As I explained earlier, I do as much daytime observing as I do at night and in this capacity, the telescope has thrilled its owner with crisp, high resolution details of the Creation, especially at powers in excess of 100x, where traditional spotting ‘scopes with their smaller apertures, rapidly run out of light. This is all well and good but Newtonian reflectors produce images that are both up-side down and right-left reversed, making traditional kinds of nature spotting problematical. Try observing a distant ship at sea using a Newtonian to see what I mean. These limitations led me on a quest to acquire and test a variety of products that promised to remedy this problem. The SkyWatcher 10mm Erecting Eyepiece. Costing about £25 plus shipping, the unit also comes with an extension tube, which was not found to be necessary. It works by using an internal roof prism sandwiched between the field lens and eye lens. The eye lens is anti-reflection coated but its field lens is not. Examining the roof prism also indicated that it was not coated. The coated eye lens of the SkyWatcher erecting eyepiece. The field lens has no anti-reflection coatings. The consequences of not coating all the optical components, even if perfectly executed are three fold; first contrast will be diminished, secondly, it will cause ghost images when observing bright objects. Finally, it will lose light producing images that are a fraction dimmer than conventional eyepieces with good coatings. Optically, it delivers a power of 65x and the image is reasonably good and sharp, with a nice, hard field stop. It is very small and lightweight but it lacks the punch of a regular eyepiece that possess either fully coated or multicoated lenses and performs poorly when imaging bright daylight objects such as water reflections etc. Examining the bright planet Venus one evening, the eyepiece revealed prominent ghosting in the image which I found distracting. If you are looking for the best images from daylight tests, this is not a product I would recommend. Two such devices were purchased; one unit called “Angeleyes” and the other marketed by “Datyson”. Both devices enable one to use eyepieces interchangeably and cost about £30 plus shipping. The Angeleyes and Datyson image rectifiers. Both are 4.5 inches long, with only the upper bodies protruding above the focuser. Both have a multicoated Barlow lens placed ahead of an internal roof prism. The selected eyepiece is mounted inside the upper body and secured with a single screw. The multi-coated Barlow lens at the bottom of the image rectifiers. In what I consider to be rather nefarious marketing, one of the units was advertised as delivering a 1.5x amplification, while the other stated that the Barlow delivered 2x. In fact though, both products were identical apart from their labelling. Worse still, the amplifaction was more like 3x on both units. Examining the internal roof prisms showed that they were uncoated. All eyepieces tested came to focus with these units. The lowest power oculars tested; a 32mm Plossl and 25mm Celestron X-Cel LX produced images that were quite good, but in order to see the full field of view your eye must be placed about an inch above the eyelens. In other words, the eye relief with these units is huge! This was not found to be an issue in and of itself, and indeed made the experience very relaxing. Still, they did not deliver the low power views that I was enjoying using these eyepieces on their own; they amplified the image too much. Instead of having a low power of 20x and 26x respectively, these units were giving images of the order of 60x; not low enough to enjoy wider fields of view during daylight hours. Eyepieces are mounted into the upper stage of the image rectifiers. Testing these units with higher power eyepieces showed that they produced far too high magnifying powers that were not as sharp as the equivalent eyepiece at the same effective focal length. This was confirmed in nightime tests, where one of the units did not resolve Epsilon 1 & 2 Lyrae as well as a normal high power eyepiece. Image sharpness was definitely compromised. Though certaiinly useful, I would not recommend either of these units to those looking for the best daylight performance from a small Newtonian telescope. Schmokin; the Vixen terrestrial image adapter. The Vixen terrestrial adapter was purchased from an authorized Vixen dealer within the UK. Costing £80 delivered, the unit is a three lens system and does not employ roof prisms. The product is very well engineered and executed in a quality, all-metal body. It has a modular design, with three sections that thread into each other. It was fun taking it apart. Examining all the lenses on either side of the various segments showed clear blooming. The lenses are all anti-reflection coated. The device is about seven inches long. The top lens showing anti-reflection blooming. The bottom lens showing blooming from anti-reflection coatings. Like the previously discussed units, the Vixen adapter allows one to insert any eyepiece into the upper stage. 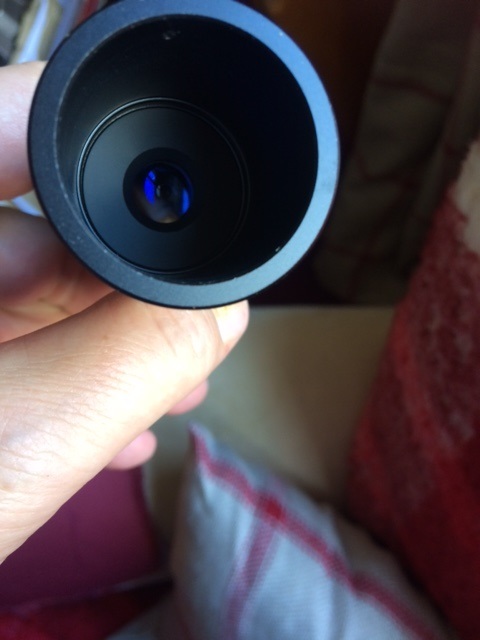 But unlike the fomer, there is no amplification of the image, so the magnification you get from the native eyepiece is preserved using this device. Only 1.25″ eyepieces can be used with this unit. Testing the device out on daylight targets, the Vixen unit delivered crisp, clear images across a field that maxes out at ~1.5 angular degrees. Since my preferred low power eyepiece for the 130mm f/5 Newtonian is a 25mm Celestron X-Cel LX (26x), this results in a reduction in the true field available to the native eyepiece but it was still wide enough to satisfy this tester. At the telescope; the Vixen adapter with the Celestron 25mm X-Cel LX eyepiece attached. Like the prism-based image rectifiers, the Vixen unit has very large eye relief, with the result that you have to move your eye above the top of the low power eyepiece to see the full field. I found this arrangement to be very comfortable. The Vixen unit produced excellent images with higher power eyepieces, including an 11mm ES 82, a Park Gold 7.5mm, a 4.8mm T1 Nagler and a 2.3mm Celestron X-Cel LX, delivering powers between 59x and 283x.The shorter the focal length of the eyepiece, the closer one has to place one’s eye above the eye lens. Comparing the views with the eyepieces used alone, there was very little light loss, with image sharpness and contrast remaining very high. Switching to nightime use, examination of a bright waning gibbous Moon with the Vixen unit produced very satisfactory results. The lunar regolith was razor sharp at all magnifications between 26x and 283x and I could also confirm that the maximum true field delivered was 3 full Moon diameters, or about 1.5 angular degrees, as previously estimated. A brief test on Epsilon 1&2 Lyrae with the 2.3mm Celestron X-Cel LX ocular delivered much sharper images of the four components. Optical quality is clearly superior to the roof prism-based units previously described. Based on these tests, I am very happy to recommend the Vixen terrestrial adapter to prospective buyers, as it will deliver very good, clean images of daylight targets in their natural orientation. That Vixen has developed and brought this product to market suggests that there is some demand for terrestrial viewing using small Newtonians. Why create such a high quality product if there is no demand for it? Being accustomed to using the slow motion controls on the Vixen Porta II mount using eyepieces that naturally invert the image in Newtonian mode, it takes quite a bit of getting used to learning how to accurately manoeuvre the telescope using the same slow motion controls when viewing in terrestrial mode. This comes with the territory. Like everything else, practice makes perfect! Though the adapter looks awkward, it is very easy and comfortable to use. Close focus distance is ~ 20-25 yards. Tried it tonight on the Moon. I thought it performed quite well. It made no major differences to the views through my 32mm and 20mm TV plossls. The image was exactly the orientation I see by naked eye and binoculars – just what I wanted! It was funny, however, moving the scope. I have trained myself well, so I kept heading the wrong direction :lol:. But I got the hang of it. Next to try it on a starhopping exercise. I’ll wait for dark skies. Preamble: Please consider this review of the Celestron 100mm aperture ED spotting scope. The reader is encouraged to consider its specfications, including weight, complexity of the design, magnification range, colour correction, twilight factor, field of view, close focus distance and cost. The reader will note that this is one of the more economical models on the market; the equivalent premium products are much more expensive. You can see at a glance that the Newtonian will offer brighter, higher resolution images at high magnifications than the ED spotter. It’s not rocket science. Think pixels. The 130mm has more ‘pixels’ than the 100mm ED spotting ‘scope. The Newtonian will also work considerably better in low light conditions (better twilight factor) compared with the refractor. I especially appreciate this during the very short days of winter, where light is often at a premium here at 56 degrees north latitude. It was very noticeable last winter when I was conducting tests comparing a 90mm ED refractor and the130mm Newtonian. The spotting ‘scope is more rugged than the Newtonian but that’s because it must be by necessity; it has to protect all of the components that make it work well. No such fussing is needed with the Newtonian, which can be knocked about and whipped into perfect collimation as and when required .It’s the ultimate low-stress ‘scope! Best of all, the price differential is huge. I’ll leave it up to the reader to decide if the 100mm ED spotter represents genuine value for money, but I can say with certainty that the Newtonian most definitely is. Having said all of this, for many objects I view during the day, an erecting adapter is quite unnecessary and when I don’t need to use one, I don’t. For night use, the Vixen terrestrial adapter sits pretty in its box. I’m happy with a topsy-turvy cosmos lol. Moral of story: Improvements are costly! Neil English explores the history of four centuries of visual telescopic astronomy in his new book; Chronicling the Golden Age of Astronomy. After conducting all of the above tests using the various image-erecting devices, I found this recent thread on the same topic. The reader will note that some of the posters have conducted their own tests which affrm the conclusions I have drawn in my own work. See here for full details. Thanks very much for the test of the Vixen erecting item. The lack or very minimal loss of light and sharp images is very encouraging. I made a test this morning that is posted in forums and copied below. The loss of light was a factor that was not encouraging, the image remained pretty sharp. I will not keep the XT8 reflector or the Celestron AstroMaster 130 EQ Reflector. I may in the future try the Omni XLT 120 refractor or a NexStar 6 SE due to their easier handling and perhaps sharper images in a fairly small light package. I believe from your test I would very much like to use a Vixen unit on a refractor or SCT for terrestrial viewing so as to not have to keep my head bent over either a 45 or 90 degree erector. I just, on an Orion XT8 Reflector, (clean mirror and recent collimation) started with a 2X Barlow, followed by a 90 degree erecting prism turned to the rear and then a 40mm or 26mm eyepiece. Focused on a 14,000′ peak 18 miles away. Standing to the side of the scope and looking forward into the eyepiece gives a fully erect image. I will try this on a closer target and see how the light and higher power eyepiece selection works. There is a fairly significant loss of light with this setup (all entry level items). Perhaps with a higher quality erecting prism and Barlow light loss would be somewhat less. The blog is really about how Newtonians can be used to view nature terrestrially. For refractors and catadioptrics, you can use erecting prism diagonals for pleasant low power applications but they don’t perform well at higher powers. I once splashed out on a fairly expensive WO erecting prism diagonal and was disappointed by its vignetting with 2 inch eyepieces and its inability to render good hgh power images, so I sold it on. A C5 or C6 is a nice compact ‘scope but it will have reduced contrast compared to a Newtonian owing to its larger central obstruction. I hope your OMNI 120 project works out well for you.